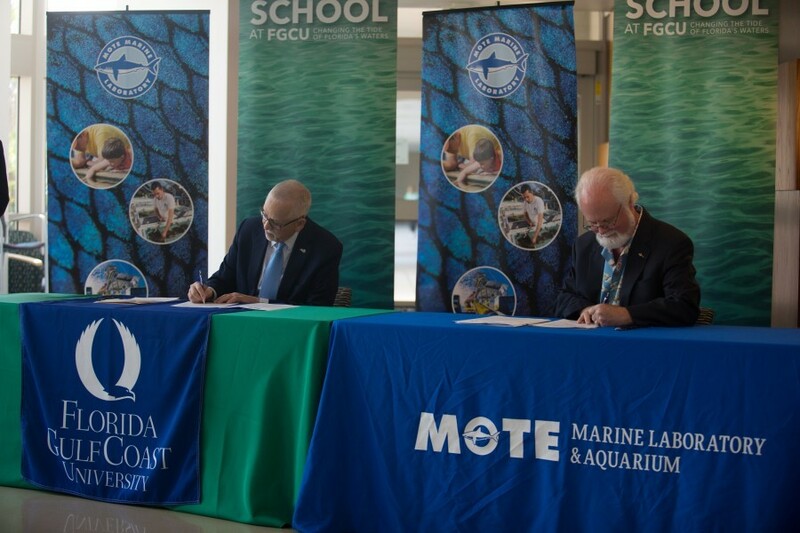 On April 4, 2019, Mote Marine Laboratory & Aquarium and Florida Gulf Coast University (FGCU) entered into a Memorandum of Understanding (MOU) to kick off a partnership that addresses impacts of harmful algal blooms (HABs) to Florida’s environment, economy and quality of life. The signing took place in Seidler Hall on the campus of FGCU in Ft. Myers. This MOU, signed by Mote President & CEO Dr. Michael P. Crosby and FGCU President Dr. Michael V. Martin, sets the framework for future collaboration between the two organizations. Mote and at FGCU will pursue productive scientific research, innovative technology development, and undergraduate and graduate education with a focus on harmful algal blooms. Joint appointments of instructional and research faculty for undergraduate and graduate courses, procurement of funding for research, and implementation of cooperative research projects. Located in the midst of Florida's complex freshwater and saltwater systems, The Water School at Florida Gulf Coast University is uniquely positioned to explore water-based issues. The health of waterways impacts surrounding ecosystems, regional and state economies and people who rely on water for life and leisure. By taking a leadership role in this vital arena, FGCU acts as a catalyst for change in Southwest Florida and throughout the world. Through its interdisciplinary approach, The Water School at FGCU not only focuses on the environmental sciences, but also draws in the social sciences, business and engineering. For more information, visit fgcu.edu/TheWaterSchool.